This is an implementation of the Electronic Design article #11935 on implementing a frequency mixer with op amps using the Tellun MUUB-4 pcb. This design requires that the LO input be greater than the RF input for correct operation. 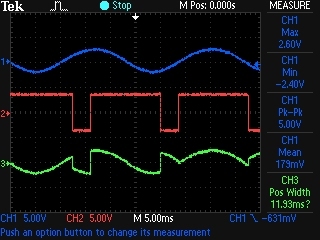 I used the fourth available op amp section to add a bit of gain (1.2X) to the LO input. 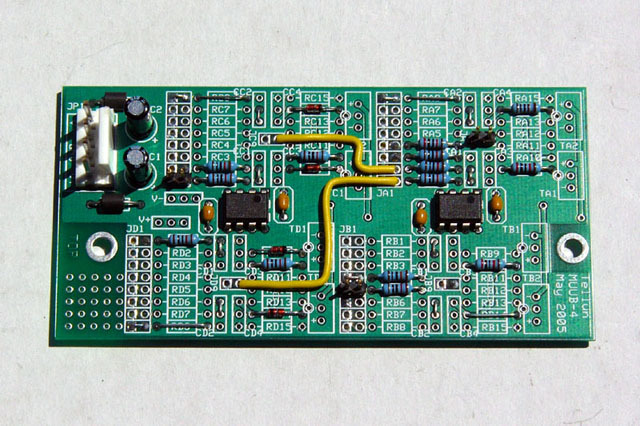 This is a photo of the assembled MUUB-4 which will mount as a daughterboard on a MOTM-890 uMixer. 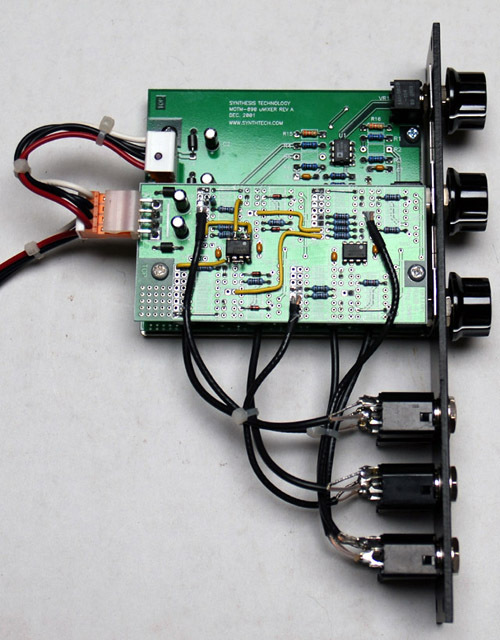 Here are some scope images of this mixer with a sine and square wave inputs. This is a same setup as above but into a two transformer / four diode ring modulator. It sounds virtually identical to the frequency mixer. This is a triangle waveform into the FM input and a triangle waveform into the LO input. You can hear the frequency double as the LO goes through 0 volts. This sounds very much different from a ring modulator. This is a same setup as above but into a two transformer / four diode ring modulator. It sounds much different from the frequency mixer since there is no audible frequency shift. This is a demo of the frequency mixer. One VCO is driving a Blacet Mini-wave which is the FM input. 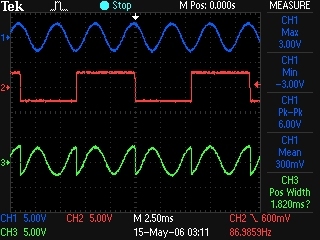 Two LFOs are driving the bank and wave inputs on the Mini-wave. Another VCO is driving the LO input. This VCO is frequency modulated by a sawtooth LFO. The LFO is frequency modulated by a sample & hold through slew. Bits of it sound like the Krell machine from the Fobidden Planet. I decided to use a MOTM-890 as a base module for the frequency mixer. It was inexpensive and easy to make modifications. I eliminated the IN-2 and IN-4 inputs and replaced them with the FM and LO inputs. I normalled the frequency mixer output to IN-5 jack. The FM input is normal when LO = +5V, inverted when the LO = -5V, and is full wave rectified when LO = 0V. With no input to LO, this unit can function as a 3 input mixer with full wave rectification of the FM input. Neat. I also piggybacked an extra op amp buffer on the MUUB to raise the input impedance of the FM input. I used black printed labels to cover -2 and -4 on the controls, the stripes between the jacks, and to add the FM and LO labels on the jacks.